We’d like to remind members that, in order to compete in SPA competitions in 2017, you will need to be in possession of a new SPA licence (the new credit card design) and this must be produced at registration for each competition. It takes around 4 weeks from your application to receive your new licence. With this in mind, we suggest you apply for your licence no later than Sunday 12th March to ensure you have your licence in time. Licences can only be issued to those who are either members of a SPA affiliated club or who have paid an individual SPA membership fee. You can apply for your licence by clicking on the link in the ‘quick links’ section to the right of this page. Please don’t leave it too late. The SPA have received details of the 2016 Jersey Open competitions. You can see the details and entry form by clicking on the link below. Posted in International News, Other News, What's On? 3 SPA coaches (Mags, Monty and Colin S) travelled to Stow to help them run a Petanque competition as part of their annual ‘Stow Sports’ week. 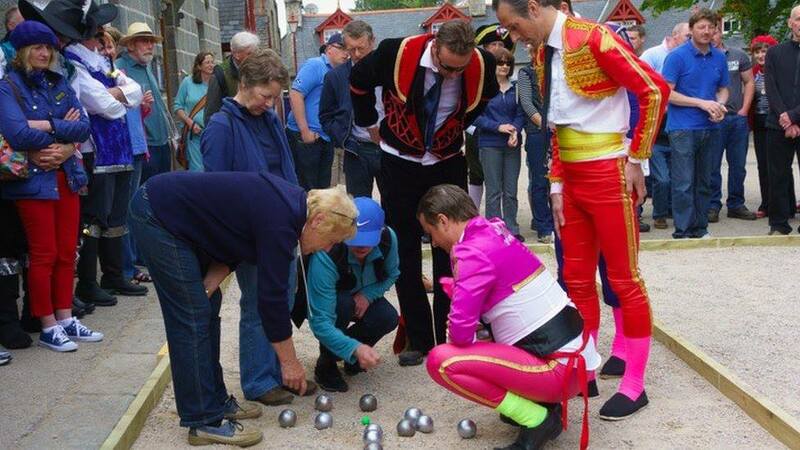 The comprises a number of events including the opportunity for residents of the village to try out traditional games and this is the second year they have chosen to showcase petanque. Sadly with poor weather the chip van was far more popular than the petanque although those who did brave it to the end seemed to have had fun. The SPA would like to thank the organisers, Stow Parish Archive for the invitation to attend and in particular their very kind donation. We hope Stow will continue to embrace petanque in the years to come. SPA President Colin Stewart attended Monymusk Boules Masters competition on 8th June having accepted an invitation to act as time keeper and arbitrator. 30 teams of 4 players pre-registered to play in the charity event. 12 pistes were erected in the village square (and dismantled within minutes of the end of the event) by a squad of burly volunteers. With musical entertainment (accordion player and a jazz band), bunting, French food and wine, an enormous raffle and cake stall the event was a roaring success. The boules became more competitive as the day went on, timed qualifiers in the morning and knock-outs in the afternoon. Many players were new to the game, with a sprinkling of the odd team with a bit more experience. And the fancy dress! Where else would you find matadors, Musketeers, Napoleon Bonaparte and extras from Les Mis in the same place at once, not to mention the countless berets, striped mariner t-shirts and strings of garlic! Well done to all involved for their meticulous planning, organisation and enthusiasm. The event raised cash for local charities and the talk was soon about doing it ‘bigger and better’ next year. We hope so. I can see from the SPA website that you have a link to the Grand Slam of Petanque series. Could you please promote on the site the first event which is being held in North Yorkshire just north of Ripon on Sunday 5th May. I am aware that this unfortunately clashes with the Celtic Challenge, but I imagine there may well be other teams north of the border that might like to travel for this, particularly given its location (at a theme park and on the edge of the Yorkshire Dales) and given that it’s a bank holiday weekend. I am really keen to promote the sport more in the North of England and am delighted that my club has been awarded this inaugural competition. Unfortunately I had little choice over dates this year – but hopefully this will become an annual event, and a date in 2014 can be selected in close liaison with your calendar. For each Grand Slam event, which can be entered as a stand-alone or as part of the series, after the morning leagues teams will qualify for a gold, silver or bronze knock-out, with first round losers of the gold and silver then moving into the next competition down, thereby giving a minimum of 5 games I understand. The intention is to have cash prizes for top 4 of each tournament, with £300 minimum as the top prize for the Gold event (numbers permitting). Registration is to go live very soon with a dedicated website – when available, would you promote it please. I am happy to provide further information to members as required. thank you. The 2013 Frankfield Boules Blitz will be held on Saturday+Sunday, 7+8 September next. The ‘Blitz’ continues to attract players from Wales, England, France and Sweden, as well as from Ireland North and South. The weekend has always been most enjoyable, along with keen competition throughout. We welcome players of every standard and from all clubs. Those of you who have competed in the past, will know that Day One is a qualifier, with the results determining which competition each double will be in on Day Two – the aim being, to have teams in a competition of their own standard on Day Two. Depending on entry numbers, Day Two will have two or three competitions. 1. Teams come to Frankfield as doubles and compete on Day One in a round robin qualifier which will determine which competition they are in on Day Two. Day Two will also be a round robin for each of the two/three competitions. Final details will be published at the start of Day One, along with scoresheets etc. As always, on each day, each double will select a sealed envelope which will contain their draw for the day. 2. 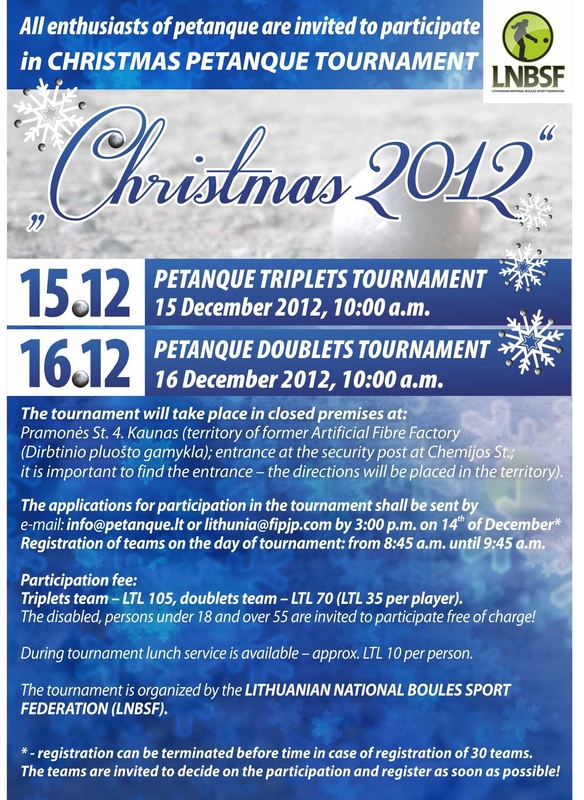 There will be a special prize of €100 for the top scoring mixed double. This prize is confined to qualifiers in the premier competition, The Complete Cuisine Gold Shield. It will be awarded to the top mixed double in the premier competition, regardless of their placing in that competition. However, if the winners of the premier competition are a mixed double, this special prize will go to the next best mixed double in the premier competition. Note: no double can win more than one prize. 3. Entry fee is €25 per double. Please let us have your entry by e-mail or phone to the Secretary not later than 23 August 2013. 4. Registration time on Saturday, Day One, is 9.15am sharp, with play commencing at 9.45am. Please circulate your club members about The Frankfield Boules Blitz 2013.